All Indie: Tell us about your career. How did it all start? Gillian: My career began unfolding the day after graduating with my B.A. in Speech Communications. The day after the ceremony at Long Beach State I did my first shift as a Broadcast Journalist on a then famous Rock & Roll station KNAC FM. Over the next 20 years I covered the dial AM and FM finally ending as a DJ/Air Personality at 103.9 KACE FM where I owned afternoon drive 2 – 7pm Monday – Friday! I LOVED that job! In 2000, stuff happened, the industry and life changed. Next thing I knew I was parking cars for a living! What?! Yes! True story! Ha! Actually, KACE was sold and the new owners turned it into a language I don’t speak so I was job hunting! Found a cool company of female valet parkers that I just couldn’t resist! Fell in love with the concept, the product and as the daughter of a precision driver, I was a natural for handling any Maserati or Lambo to come my way! I ran this company for a while in an effort to learn the operational part of it. I offered my service as Operations Manager for a mere $10 per hour in exchange for the opportunity to apprentice under the owner promising that if I liked it and was good at it, I’d buy it from her. Nearly 2 years later, with her company now larger and more profitable than she’d ever experienced in her 19 year history, she fired me and proceeded to turn down all of my 5 offers to buy. What was I to do?! Here I had an amazing skill for an incredible product which I loved and had grown to master. The business and the know-how was a burning passion inside me. I prayed for a sign. I said, “God, give me a great name and I’ll know I’m supposed to do this”. I brain stormed for 3 days and on that final day Valet Of The Dolls was born! In that moment – silent electricity and my mind couldn’t help but travel in a flash to moments when as a latch key kid, home alone I sat on my Dads side of the bed. Inside his nightstand drawer (where I wasn’t supposed to be looking!) was a copy of the paperback, “The Valley of the Dolls”. Though I never read it, I was always fascinated by it. And now, Valet Of The Dolls, made perfect sense to me. I did see a potential sticking point in the name given the racey subject matter of the book. I would have to market around and through it. In the book and movie Valley of the Dolls the ‘Dolls’ were …not people! Right?! Lol! But in our story VALET of the Dolls it’s completely different, as the Dolls are attractive (145 women and about 5 guys), kind, helpful people who can maneuver your Bentley, in reverse, with quarter inch precision! Nearly 15 years old now, Valet Of The Dolls provides valet service to roughly 600 private events per year serving Los Angeles, Orange County and Palm Springs California. The beauty of owning my own company has been the flexibility to explore my truest desires and studies in alignment with my life purpose which is in the realm of Spirituality and Metaphysics. Over the years I studied to hone my gifts as a medium, channel and intuit. Ultimately I climbed the ladder of attunements to Reiki Master/Teacher (Usui & Tibetan Reiki). I was eventually ordained a minister and earned a Masters Degree in Spiritual Psychology. I own an additional company called ‘Bless & Clear’ which specializes in sacred ceremonies. Weddings, house blessings & clearings and more than a dozen other types of passage rites. Most recently, there’s been a surge in requests for ‘Conscious Decoupling’ ceremonies! This has led to a processing workshop to prepare singles and severing couples for their Conscious Decoupling Ceremony which is (in short) a rite of passage blessing and celebrating what was, what is and what shall be. - How did my career start? Which one?!! I’m also an author and speaker which is the newest career but feels born out of all the previous. I guess my career(s) each started with… an idea and a resulting feeling that screamed “YES!” from my heart & solar plexus simultaneously. I then follow the visions, one at a time, setting them in place with 100% focus on manifestion. All Indie: Who are the most memorable people you met while you worked in Radio? Gillian: Stevie Wonder (worked for his 102.3 KJLH, then interviewed him live, in-studio at 103.9 KACE), Gladys Knight, Patti Labelle, Lionel Richie, Tina Marie & Rick James and a really amazing on-air colleagues like, Wolfman Jack, Charlie Tuna and the Real Don Steel. After enjoying them as a kid, what an honor it was to share the airwaves with them. And there were also many other talented people who became friends and made going to work even more fun! All Indie: Looking back, who was your most influential figure or figures? Gillian: In Broadcasting: Two women in particular; Linda Ellerbee and the late Jessica Savitch. So poised. Delivery that would absolutely mesmerize me! These two ladies in particular were masters of inflection unlike anything I’ve yet to experience from anyone else since. Well, other than me! They taught me to deliver my information in a professionally brazen & daringly raw way. – How to work a pregnant pause to its very …last …beat! In Spirituality: Visionary Michael Beckwith, Author/Teacher Marianne Williamson, Medium James Von Praagh and Multi-Dimensional Healer Lori Board Camacho. 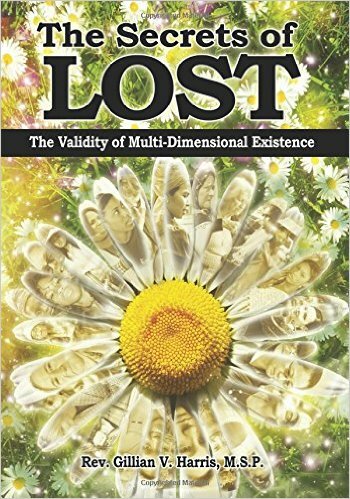 All Indie: You recently wrote the book, The Secrets of Lost: The Validity of Multi-Dimensional Existence. What inspired you to wrote this book and what is it about? Gillian: I was inspired by a combination of things; my life-long involvement in and study of metaphysics and my experience of watching the T.V.Series ‘Lost’! I’m not even a T.V. watcher! The mere fact that I bumped into this series and watched the entire (121 episodes) (TWICE), is amazing! What came forth for me from seeing the series the first time, was the opportunity to use this exciting show as a springboard for discussion about life and life after life – and maybe a little life in between life, while we’re at it! I enjoyed bringing as much science as I could to the subjects but it’s also very spiritually thought provoking, comical and intermittently vulnerable as I share from my personal hearts journey in facing life and the transitions of my most beloveds to life after life… Ultimately, the book is about living and doing it with no reservations or fear! All the while, know that the people you are closest to in this incarnation – and even some you’re not so close to (!) are sharing other incarnations with you in other dimensions, at this very moment. The book explains why that’s VERY mportant information! For clarity; There is no life after death. Because …there is no death. 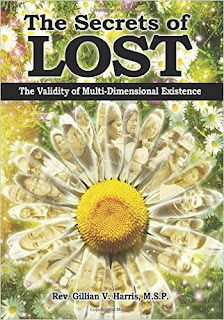 There is only life…after life, after life… ‘The Secrets of Lost’ reveals what’s really going on. How MUCH is going on. How BUSY we each are, here, there and everywhere! It explains why, right now, you and me, are as dead as dead gets! All Indie: What is in store for Gllian Harris in the near future? What can fans look forward to? Gillian: Getting “The Secrets….” Out is an exciting campaign for me. I’m looking forward to book signings and other opportunities to meet not only like-minded beings out there who may have read the book. But also looking forward to simply engaging in conversation about the subjects covered in the book. My overall goal with this information is to share the comfort understanding can bring.